Price on an FM Hi-power? Saw a decent looking one at an (local) auction preview, starting at 1$. I looked at gunbroker to see what they are running, but cant see ended items like you can with ebay apparently. Not that I really need the thing, but what would be the going rate you think? Condition looks around 90% or so, no aftermarket add ons, original box & stuff. IIRC, they are identical to the FN's as far as parts are concerned. Last time I looked at them was about a year ago and they were selling for about $450 give or take $50 depending on condition. I’m not sure on the parts interchanging which I was in the process of researching before my spending money got spent on some other gun parts that I wanted that I just couldn’t pass up. Sold for prices can be seen by clicking on advanced next to the search window. Then on the next page select completed items. Then enter what you are looking for and scroll down and find the pull down and select last 30 days then click search. Used to be 90 days but they changed it. As for identical parts, I cant vouch, but the shortened FM 'detective' top end/slide assy I had fit and worked just fine on an FN made lower/frame. Paid $500 or so for a LNIB version. It had a receipt in it from around 2000 showing it originally sold for about $250. I like mine, and it shoots well. Matches nice next to my factory Argy. I'll point you to Mishaco for infohttps://www.youtube.com/watch?v=PCzoUjfXtfw on this one. 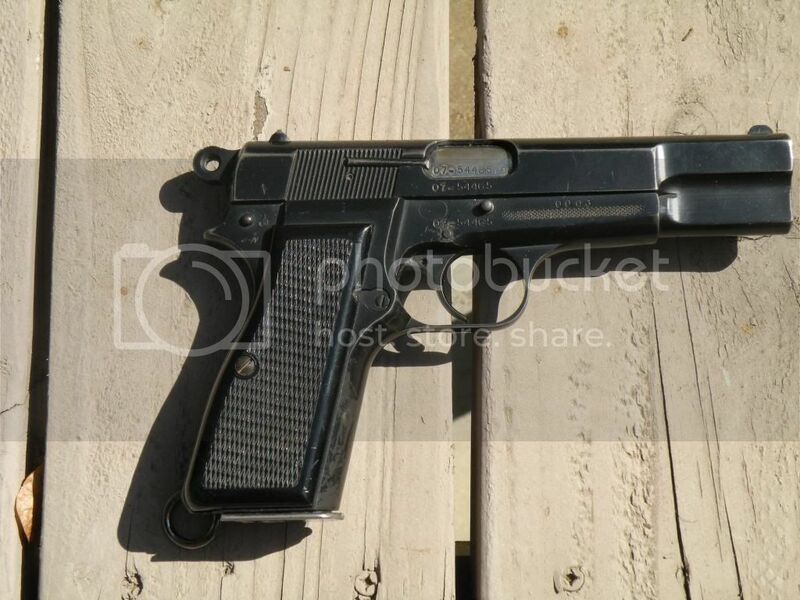 $500 range would be a good deal if its like new [to me] and import markings are usually pretty minimal. If its one of the early ones it may actually be an FN made gun. They are actual licensed production so parts are 100% interchangeable and they are great shooters. FM's, unlike some FEG's, are completely compatible with FN Hi Powers. I picked my M95 up for $250. I kept that one and sold my FN since the Argentine shot better. Well, it went for 475$ + tax & buyers fee for a total of 555$. I didnt buy it. If the buyers fee wasn't there, I would have considered a higher bid. I might have one in VGC I'd consider parting with. I stopped carrying my FM HP Detective model about a year ago because the prices on these seem to be just going higher and higher. A few years ago they were really cheap. Overall they are very good pistols, just not as pretty as the Browning or FN models. I hardly ever take my FN model out anymore, with the prices people are getting for them I hate to put any wear on it. Sold one on consignment for $450 4 months or so ago. Only sold it cause I want one with the FN lightening cuts. I'd be willing to go up to $500 for one made under FN licence and in decent shape. I paid $200 for mine with four mags and a couple of boxes of ammo over a decade ago. From a cancelled Chilean contract (with defaced property markings for the Carabineros de Chile and a contract serial number). That’s one that would be a nice throw in the console type. I like. Plus someone steals it out of the car you won’t cry for long. I bought mine in 2007, brand new in box for less than $400. I got one on Gun Broker a few years ago, with a ring hammer, 4 Mec Gar magazines, lanyard loop, and a gun rug, for a little over $300. I was the only bidder. These are a great bargain. This one has become my favorite Hi-Power.